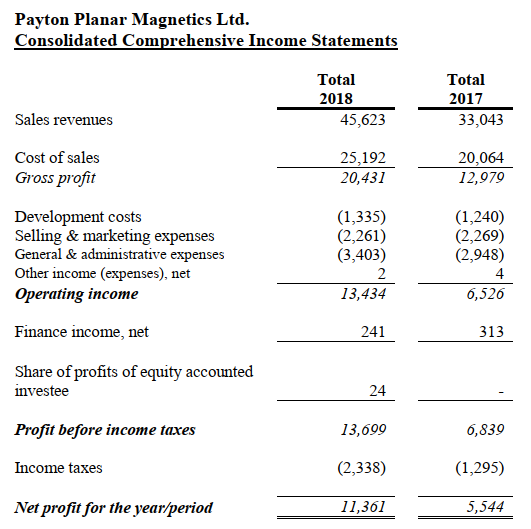 Driven by the adoption of Planar Transformers in EVs, Cloud Switching and Aerospace, Payton reported strong 2018 numbers: 38% YoY growth, EBIT up 100%, 500bps GM% expansion YoY. While 2019 "hard" backlog may seem soft, it excludes the booming 2019-20 EV business and was ephemerally influenced by its biggest customer switching capacity from China to Taiwan. The disclosure of Payton’s top customer (Quanta Computer) revealed that Payton sells massively into Hyperscalers Data Centers (e.g AWS/FB) and presumably the hyper growth AI section within. Payton is not only a play on the EV revolution but also a play on cloud data centers. Following the recent pullback, valuation is attractive (2018 P/E of 8 exc. cash) as the stock is driven by oblivious retail investors. Overall, Payton continues to grow and increase its margin and profit, as it rides the shift toward more demanding electricity power supply in devices where heat, space, and weight are crucial. Recently, the market was disappointed over soft backlog numbers ($14.5M in 2019 vs $21M in 2018 as of March), which are probably driven by the temporary overall softness in cloud data centers in Q4/18 and Q1/19, as well Payton's biggest customer switching capacity from China to Taiwan due to trade tensions. Point 1: Payton’s EV business is booming. During Q1/19 its biggest automotive customer (Customer C ) quadrupled its booking expectations for 2019-20. On the surface, the backlog may seem soft, but most investors likely overlook the EV backlog intricacy. The company actually published that its EV framework agreement expanded from $46M to $74M and the 2019-20 backlog (under the framework agreement) quadrupled from Dec 31, 2018, to March 12, 2019, from $5M to $19M. Note the hard backlog number ($14.5M) excludes these $19M 2019-20 framework agreements with Customer C (automotive). The reason for the exclusion of these $19M from the formal binding "hard" backlog is because it's part of a long-term framework agreement that legally enables Customer C to cancel the order. Yet, the automotives lead times and design cycles make such a situation highly unlikely. Note that Customer C who just engaged in the framework agreement in Aug 2018 has already increased its 2019 framework from $1M to $7M during the Q1/19, meaning the short-term cancellation risk is negligible. Payton revealed in its report that its biggest customer is Tech-Front (Shanghai) Computer, a subsidiary of Quanta Cloud Technologies (QCT), which builds data centers for Hyeprscales (Facebook, AWS, Microsoft, etc.) 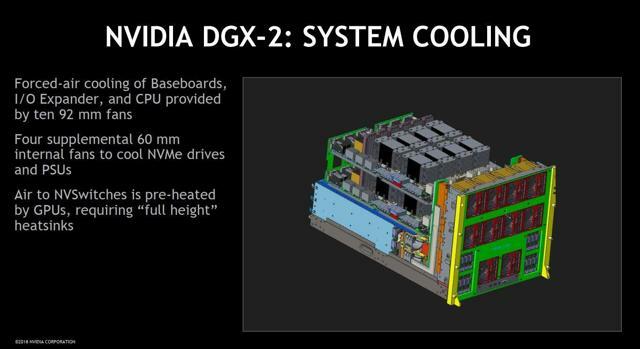 It’s also Nvidia’s partner for its DGX data center architecture, which is based in Cloud Data Centers like FB Big Basin/Big Asur. Note that unlike enterprises who buy servers and switches from OEMs like Dell, HP and Cisco, the Hyeprscales (AKA cloud providers like FB,AMZN,Goog,etc.) purchase directly from Taiwanese white label vendors, like Quanta. While the CAPEX budget of the cloud providers was increased significantly during 2018, the industry took time to digest the huge capacity added in 2018. "targets double-digit cloud growth in FY19-21 on hyperscale data center/5G strength"
And that's while the company expects slower 1Q19 momentum due to higher cost resulting from the server capacity switch (from China to Taiwan). 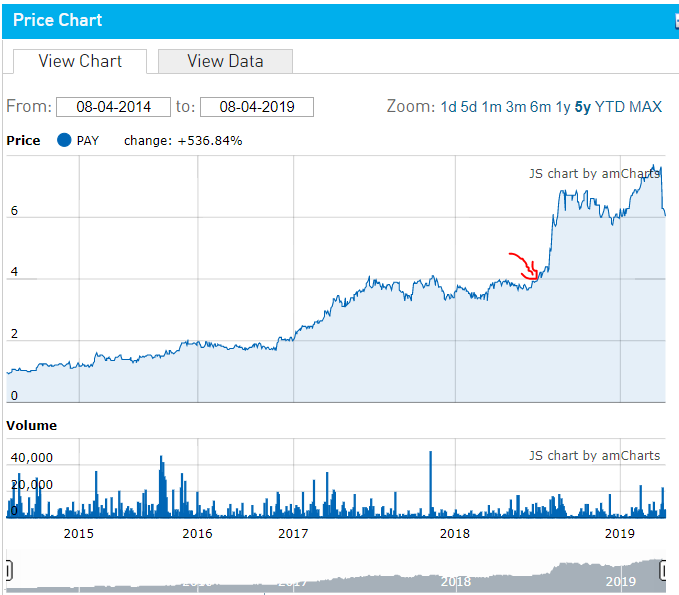 However, Quanta is still positive on its 2019 outlook given organic server growth (mid double-digit YoY)"
"The company believes its early mover advantage and technology strength in the telecom sector will help it delivera double-digit cloud revenue CAGR in FY19-21. We like Quanta's encouraging server/cloud outlook"
Interestingly, the sales of Payton to Quanta Computer (its biggest customer) started to ramp up in 2016 and grew 72% from 2016 to 2018, which is very similar to the Nvidia sales pattern. We also utilize industry-leading contract manufacturers, or CMs, such as BYD and Hon Hai Precision Industry Co., and ODMs, such as Quanta Computer and Wistron Corporation, to manufacture some of our products for sale directly to end customers. In those cases, key elements such as GPU, SOC, and memory are often consigned by us to the CMs, who are responsible for the procurement of other components used in the production process"
Needless to say, Nvidia’s GPUs are monstrous power consumers. Therefore, heat is a major problem - not to mention power stability and consistency. Since Nvidia had already alleviated concerns about inventory build-up during the last analyst day, which propelled the stock 30% higher YTD, we believe that Payton will resume its growth from its biggest customer in H2/2019 and especially 2020. That, on top of the quadruple EV backlog, may drive Payton into subsequent record years in 2020 and onward. To sum up, 2019-21 seem to be pivotal years for the electric vehicle (EV) industry, as a flood of competitive and affordable EV models hit the roads, most of which have been introduced by legacy car manufacturers like GM, BMW, Volvo, and Renault-Nissan, among which you may find Payton’s planar transformers. The above models, as well as other non-Tesla EV models, will benefit from U. .sales, as buyers will be able to enjoy a full $7,500 federal tax credit for new electric-powered vehicles, as Tesla exhausted its 200,000 car quota as of last year. Following 5 strong years, Payton is experiencing a bit of an ephemeral backlog softness that is likely due to technical reasons (switching capacity from China to Taiwan and capacity digestion of the cloud vendors and Nvidia), while its EV business continues to thrive. 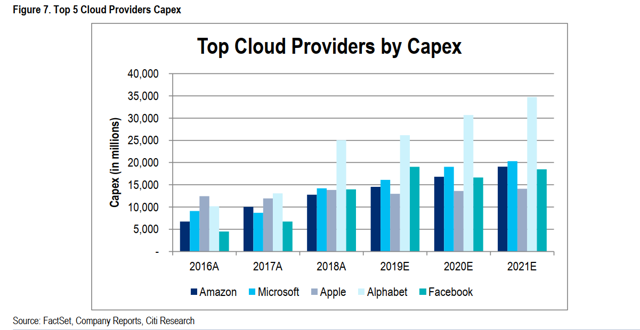 Short-term investors may see the soft 2019 backlog as a glass half empty, but those who look under the hood will realize that the 2019 lemon may make great 2020-22 lemonade, as Payton continues to ride the massive build-up of cloud data centers, especially those based on AI. Along with its prosperous EV business, the latest correction in Payton, brought the valuation to bargain ranges: 2018 P/E of 8 (exc. 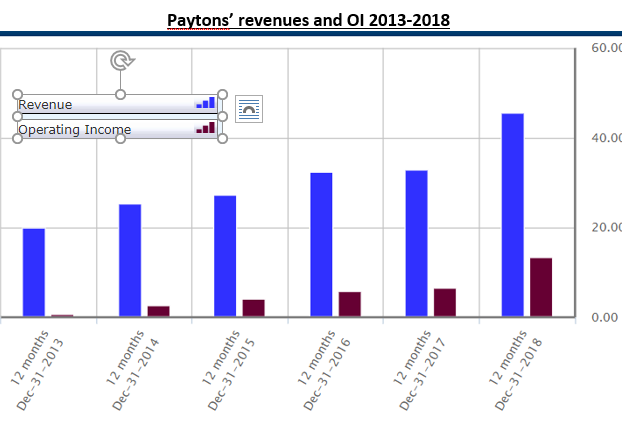 cash) and a 2020 P/E of 6.5 (exc cash), bearing in mind that Payton's income historically flowed fully to cash flow. Payton may be a great opportunity for investors to cash in on both EV and cloud data centers in one stock with sound margins of safety. Disclosure: I am/we are long PAYTON PLANAR. I wrote this article myself, and it expresses my own opinions. I am not receiving compensation for it (other than from Seeking Alpha). I have no business relationship with any company whose stock is mentioned in this article. Additional disclosure: The author isn't a professional financial advisor and this article is not a substitute to a tailored professional investment consulting that adjusted to each individual's needs and tastes.